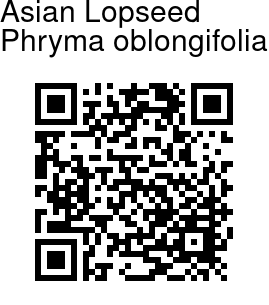 Asian Lopseed is a perennial herb up to 80 cm tall, 4-angled with opposite ovate-oblong to ovate-elliptical up to 16 cm long leaves; leaf-stalk up to 4 cm long. 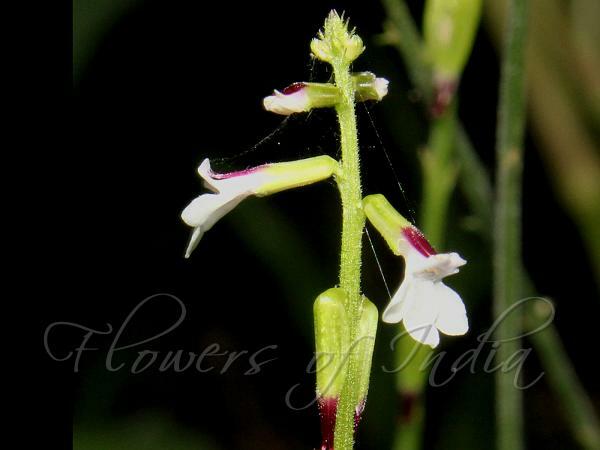 Flowers are white to pale purplish, in spikes on up to 20 cm long flower-cluster-stalks. Sepal tube is 2.5-3.2 mm long, upper teeth shorter than tube, Flower are 2-lipped, lower 3-lobed, upper bilobed; ovary hairless, fruit ellipsoid achene enclosed in persistent calyx. In typical American subspecies, sepal tube is shorter, upper teeth as long as tube and upper flower lip entire or notched. Asian Lopseed is found in the Himalaya, from Kashmir to Nepal, Khasia, Indo-China, China, E. Siberia, Korea, Japan, at altitudes of 1500-2600 m.
Identification credit: Gurcharan Singh Photographed in Kashmir University, Srinagar.